Finally, one cable for all your audio-visual needs! The Universal S-Video Cable provides the highest SD picture available for your favorite game system. 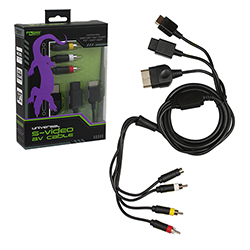 Utilizing 4-pin/mini-DIN technology, the S-Video Cable is compatible with Xbox, PS1, PS2, GameCube, Nintendo 64 and Super Nintendo, offering stereo sound and a pristine 480i Image. Compatible with all hi-def and standard television with an S-Video input, the six-foot cable allows convenient console placement and the nickel-plated connectors give you a professional gaming experience!